Legal experts say that CNN's lawsuit filed Tuesday against the Trump administration for removing CNN's chief White House correspondent's press credentials holds merit, because legal precedents in the U.S. support the network's argument. Why it matters: If CNN comes out victorious, it will reinforce a legal precedent that says government officials, even as powerful as the president, can't remove a member of the press corps' credentials for arbitrary reasons. If it doesn't, the precedent will be set that government officials can restrict access to journalists they dislike. What they're saying: Legal experts are mostly in agreement that the law is on CNN's side. "Overall, CNN has a very strong claim, particularly under the First Amendment." Breaking down the lawsuit: CNN says it has grounds to sue the administration based on three legal principles that stem from the Bill of Rights and other U.S. laws that have been tested in the courts. 1. First Amendment violation: In its lawsuit, CNN cites an established legal precedent from a 1977 D.C. Circuit Court case, Sherrill v. H. Knight. That case basically says that, while the public doesn't have a right to White House access, the First Amendment prohibits denial of a press pass "arbitrarily or for less than compelling reasons.” CNN also cites a 1964 Supreme Court case, N.Y. Times v. Sullivan, which says the First Amendment protects speech even when the president doesn't like it. 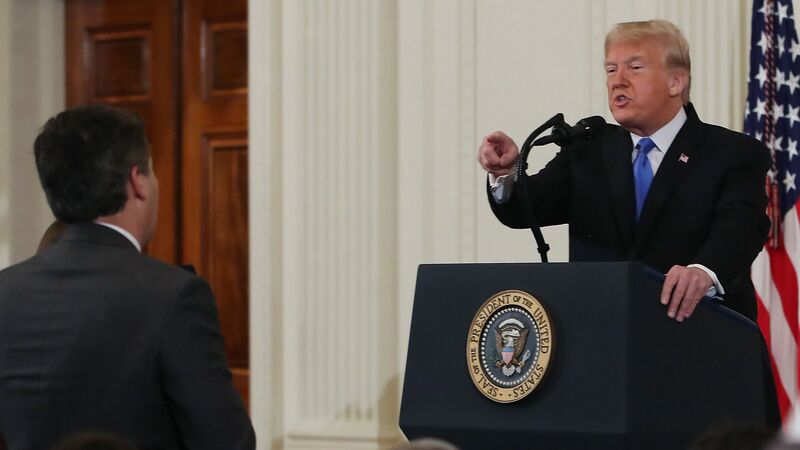 The dispute: The White House first said it removed Acosta's pass because it wouldn't tolerate "a reporter placing his hands on a young woman.” Later it changed that argument, saying the reporter "physically refused to surrender a White House microphone to an intern." This happened after Press Secretary Sarah Sanders was called out for tweeting a doctored video of the incident as evidence. The argument: "In changing the reason for which it removed the press pass, it made the White House's reasoning look pretextual," says Bruce Brown, executive director of the Reporters Committee for Freedom of the Press, which filed a brief in support of CNN's lawsuit. 2. Fifth Amendment violation: CNN asserts that the White House's decision to revoke Acosta’s press credentials violates the Fifth Amendment right to due process. The dispute: CNN argues that Acosta received no direct notice from the White House that his credentials had been revoked, nor did he receive any notice about the incident beforehand or any chance to appeal the decision, which inhibits him from doing his job. The argument: Citing Sherrill v. Knight, Josh Geltzer, executive director of Georgetown Law’s Institute for Constitutional Advocacy and Protection, which co-filed a brief in support of CNN's lawsuit with the Reporters Committee, says the government is allowed to act in the best interest of the security of the White House, within reason. "The court indicated a willingness to grant deference to the government to calibrate a security threshold, but it mandated that there be a process because it recognized this matters a lot to journalists," Geltzer says, and in this case, there was no process at all. 3. Violation of administrative procedure: CNN says that the final decision to yank the credentials by the Secret Service violates the Administrative Procedure Act, which governs how federal agencies issue regulations. The dispute: CNN says that by revoking Acosta’s hard pass, the Secret Service's actions were "arbitrary and capricious," which violates the act. The argument: This, legal experts say, is likely the easiest case for CNN to make, because it would only have to prove the violation of a procedural law rather than a constitutional right. Be smart: While many legal precedents have been set around these issues at the local level, this lawsuit is unique in targeting a sitting president and his staff. The bottom line: A strong legal framework in the United States makes it likely that CNN could win this case. That would be a defeat for Trump, who wars with the press, calls the media "fake news," and has threatened antitrust action against some outlets. What's next? The case has been assigned to Judge Timothy J. Kelly, who was appointed to the federal bench by President Trump last year. CNN has called for an "immediate restoration of Acosta’s press credentials and hard pass" while the case is being reviewed.